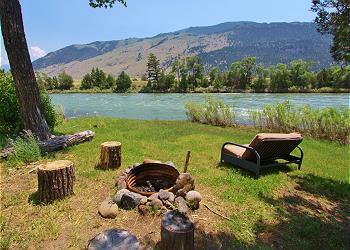 Luxury home sitting on Rock Creek with the Yellowstone River a short walk from the house. 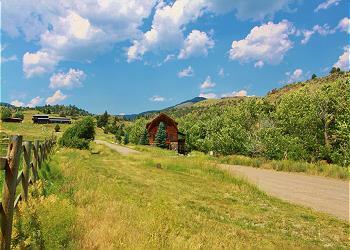 Amazing location - on 80 acres with views of the Absaroka mountains and Paradise Valley. Top of the line furnishings and amenities to satisfy the most discriminating guests. 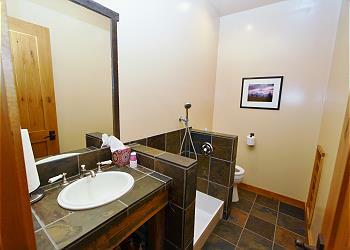 Three bedrooms and two and a half bathrooms to comfortably accommodate 6 guests. 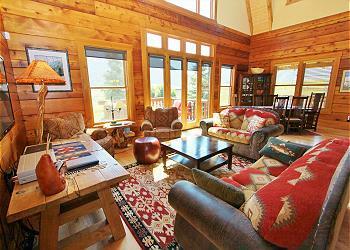 Can be rented with the Sage Ranch next door for groups of 16. BRIEF DESCRIPTION: This barn style, three bedroom home, offers guests a special place to stay just outside of Yellowstone National Park. 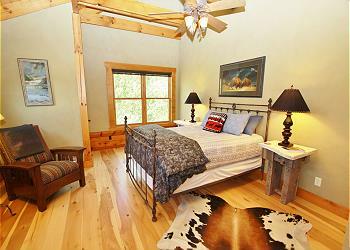 Experience Yellowstone by day and this amazing property in the evenings. Fishermen can walk to private Yellowstone River access, or dine and watch the sunset from the additional sweet riverside cabin. 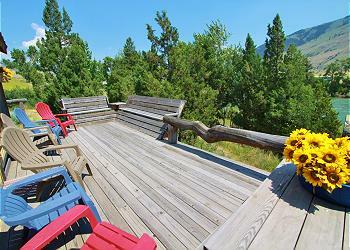 The house has three decks and plenty of outdoor seating to admire the beautiful surroundings. 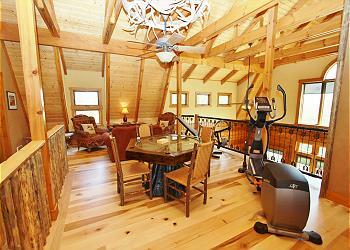 There is great hiking and wildlife viewing right from the home, and a gourmet kitchen to satisfy any chef. With its charming location, this home is the kind of retreat to just settle in and take a break from the real world! GENERAL LOCATION AND SETTING: The lodge boasts an extremely rare location just outside of Yellowstone Park with great fishing access out your back door. 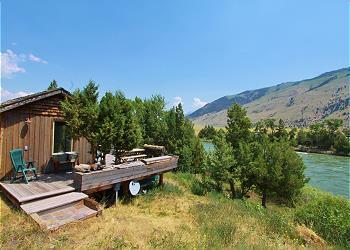 Sitting on 80 acres, just minutes from the north entrance of Yellowstone National Park, this is a special place! 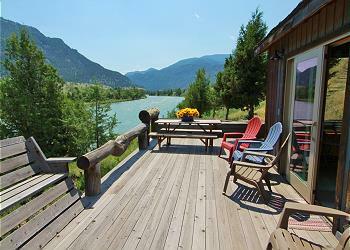 The main views are of the Absaroka Mountains and Yellowstone River. 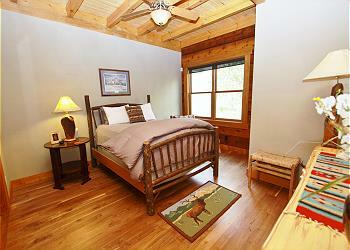 The property is home to a small herd of working horses, as well as deer, elk and other wildlife! It's a 25 minute drive to town - to both Emigrant and Gardiner. 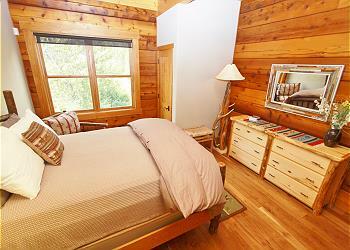 BEDROOMS/BATHROOMS: The home has three bedrooms and two and a half full baths. 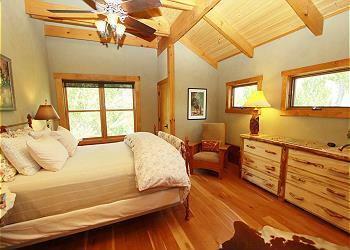 The main level of the home has a master bedroom with a queen size bed and an attached bathroom. 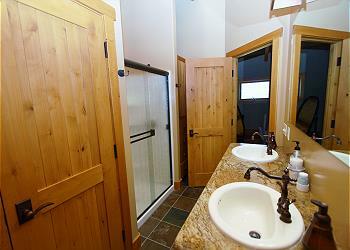 The bathroom features a beautiful shower made from river rock. 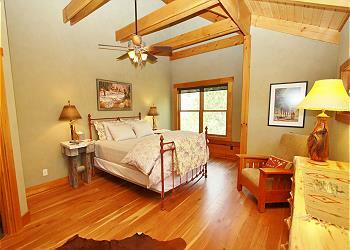 Upstairs are two additional bedrooms, each with a queen size bed. These bedrooms share a bathroom with a shower. There is also a half bath on the main level of the home. The bathrooms have heated flooring. 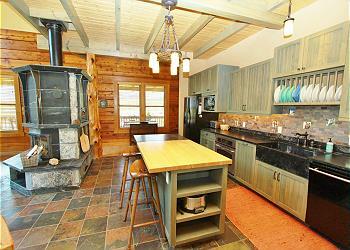 KITCHEN: The large kitchen will satisfy any chef's needs! Top of the line appliances, plus all of the cookware and serving ware you could need. The large dining table seats up to six, plus there's additional seating for four at the kitchen bar. Heated floors in the kitchen add additional comfort. LIVING ROOM: The living room has a leather sofa with additional chairs to lounge and relax. The main focus of this gorgeous room is the huge Tulikivi stone fireplace in the center of the room. Comfortably warming the home during our sometimes chilly Montana evenings. 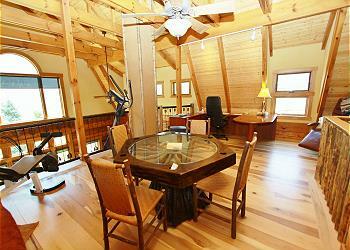 Upstairs in the open loft is a second living area with a poker table, comfortable chairs, and a desk. 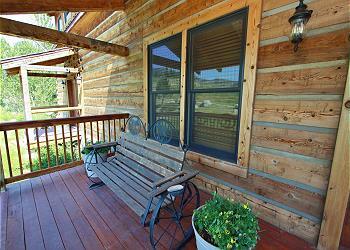 OUTDOOR AMENITIES: There are three decks surrounding the home creating plenty of outdoor seating. While outdoors, you'll be able to enjoy the sounds of Rock Creek, a historical trout spawning stream, running through the property. There is a gas barbecue grill available for outdoor meals. Guests also have access to a park like setting at the riverfront cabin with a futon, fire pit, chairs and a Big Green Egg grill. It's a great place to enjoy an evening meal or morning coffee. 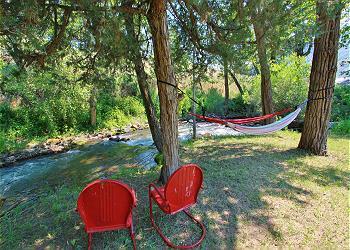 Enjoy hammocks by the creek or take advantage of the tubes and life jackets for river floating! Bikes for adults and children are available for use. 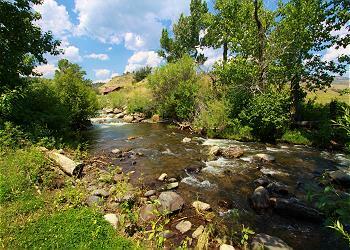 ACTIVITIES NEARBY: Hiking, wildlife viewing and nature photography are great activities while at the ranch. It's a 15 minute drive for dinner out and groceries in Gardiner - or to visit Yellowstone Park. You'll be 37 miles from Livingston or 62 miles from Bozeman. Bozeman's airport is just over an hour and a half away. We really loved this home. Very spacious and well stocked. Peaceful and quiet. So many places to sit out and just enjoy the wildlife and each others company. Very rejuvenating. We spent hours sitting on the decks in the mornings wrapped in blankets which we shed when the wind stopped blowing. The sound of the water flowing was also very relaxing and tranquil. Spent a couple hours reading in the hammocks out by the river. Loved it. Only thing we found unpleasant was the bridge was out and you would have to drive down a long, winding gravel road. They are working on the bridge but once you were back at the house you forgot about the road. Some of the locks on the doors were a little tricky but never had any problems. We played cards at the cabin that was down on the river which was also amazing Yellowstone was about 15 to 20 minutes to the north entrance. The house was very clean. We loved the Wild Flower Bakery in Emigrant and Follow your nose BBQ right next door to the Wild Flower Bakery. Would diffidently stay here again. 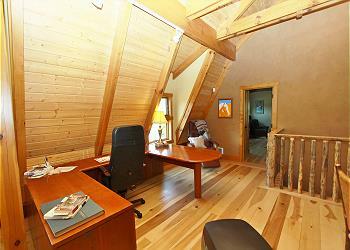 The cabin was clean, well appointed and quite charming and my guests were pleased too. With three decks from which to enjoy morning coffee, each with a fantastic view, each day started in complete peace and surrounded by heavenly mountains, the most beautiful sky and wildlife. The area and people were dog friendly so my pup was able to throughly enjoy the trail right behind the cabin, the river and other hiking areas nearby. 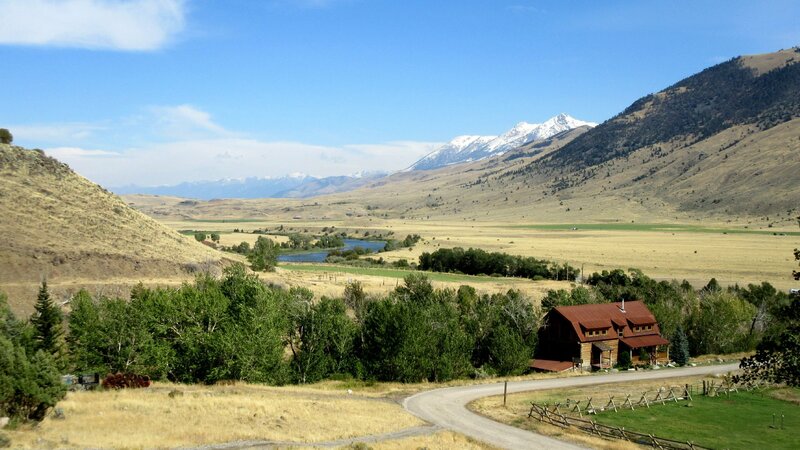 Yellowstone is just a short drive from Ashling Ranch but in reality, one would never have to leave the ranch in order to take in the pure beauty and peacefulness of Montana or find a great nature trail on which to hike. This was my first visit to Montana and it certainly won't be my last. Paradise Valley and Ashling Ranch was the perfect introduction and I highly recommend the experience. 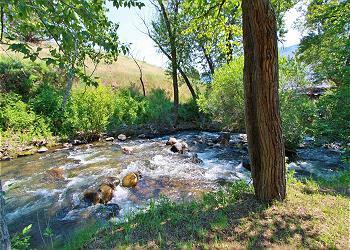 Ashling Ranch is situated in Paradise Valley, easily one of Montana’s more picturesque areas. Our “empty nest” family and multi-decade friends’ arrival was via Bozeman, which is about an hour’s drive from the ranch, provided you don’t stop in Livingston for a walkabout, lunch and a local beer like we did. Ashling’s location is pretty much ideal, just half an hour north to Livingston and 20 minutes south to Gardiner. Both towns are worth visiting, but if one absolutely must leave Ashling it’s probably for the area’s main attraction, Yellowstone National Park, with Gardiner a primary entrance. Ashling’s “Mountain modern” accommodations were clean, fully appointed, and ready for us upon our arrival. The ranch is owned and operated by long term residents of the Valley, so pretty much everything we wanted to do was easily coordinated. If you’re interested in hiking, fishing, river rafting, horseback riding, sight-seeing, exploring the majesty of Yellowstone, or just getting “off the grid” and into nature, Ashling is a great way to do it. 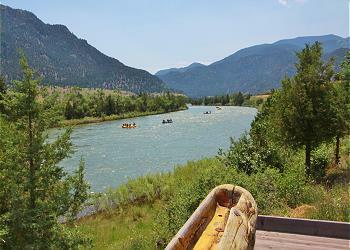 The ranch even has a river cabin on the Yellowstone River, which we found great for taking leisurely naps, reading, and telling more than a few tall tales into the wee hours. Ashling Ranch is an unpretentious and welcoming place where their nature-loving guests can be active or just kick back and relax. We’re definitely hoping to go back. Highly recommended. Thank you for your review of Ashling Ranch. The Tom Miner Basin is a special place only found in Montana, much like Ashing Ranch. We are very happy you enjoyed the home and had all you needed for a great vacation. 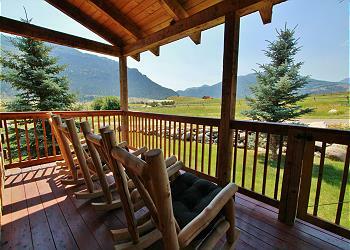 We love to hear when our guests enjoy the properties and enjoy Montana! Thank you again and hope to see you in the future. Ashling Ranch truly has it all! Fishing, hiking, incredible views, wild life, easy access, colorful local characters. Our family has been lucky enough to stay here on many occasions and the only disappointment is that we eventually have to leave. Great place for a family vacation. Thank you for your kind review of Ashling Ranch! 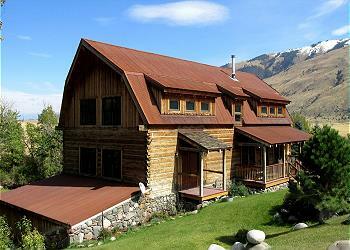 We love hearing that people enjoyed our properties and enjoyed Montana. Thank you again and we hope to see you in the future! Thank you so much for your wonderful review of Ashling Ranch! We are so happy to hear you enjoyed your stay! 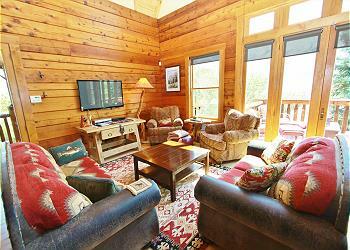 It is the goal of the homeowner and Mountain Home Vacation Rentals to make sure guests have everything they need. Mountain Home selects homes in unique locations and Ashling Ranch is one our finest! Thank you again and we hope to see you another time!